If you’re of a certain age, you start hearing the term anti-inflammatory on a regular basis. And as much as my eating habits are decidedly more millennial than they are member of AARP, I’m not opposed to healthy eating. True Food Kitchen in Bethesda appeals to the part of me that really should be paying more attention to what I’m putting in my body. There’s a lot to like about True Food Kitchen. The new restaurant – part of a chain established by physician and wellness author Dr. Andrew Weil- has a menu that’s based on his anti-inflammatory food pyramid. This gives license to a guilt-free dining experience. 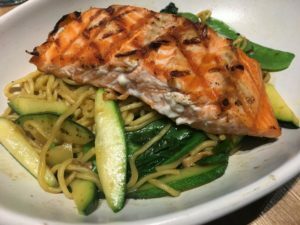 The location – smack in the middle of Bethesda on Wisconsin Avenue- makes for a satisfying addition to Bethesda‘s roster of restaurants. And the ambiance- while assaulting when it comes to the noise level- is spacious and bright. Dishes at True Food Kitchen favor lean proteins, whole grains, and seasonal fruits and vegetables flavored with anti-inflammatory agents like turmeric, garlic, ginger, and cinnamon. The concept is an appealing one, and judging from the challenge in securing reservations and the crowded dining room once we make it in, it’s resonating with diners of all ages. 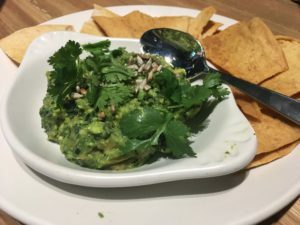 Kale guacamole helps fight flare-ups with flair. The flavorful dip includes pink grapefruit, roasted poblano, sunflower seeds, and a healthy dose of cilantro. Edamame dumplings swim in a dashi bath and benefit from a topping of white truffle oil and herbs. They’re definitely a suitable start. 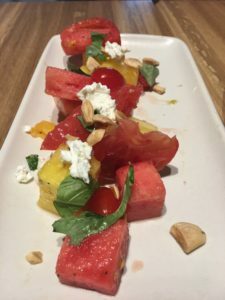 After two visits to True Food Kitchen, I’m still not immune to the charms of heirloom tomatoes paired with watermelon, marcona almonds, white balsamic, and chevre. 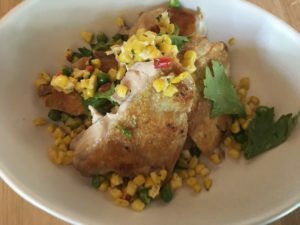 Pan roasted chicken with corn, green chickpeas, fresno chili, cilantro and pumpkin seed pesto, and feta is a dish I might normally overlook on a menu. But I’m sharing entrees with a friend, and this is a fitting companion to the poke bowl filled with wild caught albacore, avocado, quinoa, mushroom, snow peas, cucumber, cashew, and turmeric ponzu. Both dishes are plentiful, well-prepared, and surprisingly bold. The dish that I find most winning is the red chili noodle bowl with Chinese broccoli, zucchini, shitake mushrooms, snow peas and cashews. An optional topping of steelhead trout makes this a pretty swell dish. Other options on the bowls are tofu, chicken, shrimp, or grass-fed steak. I’m not particularly enamored by the desserts I’ve tried at True Food Kitchen. The offerings are primarily vegan and gluten free, which would be fine if the taste was on par with starters and mains. Key lime pie is gummy and gives off a chemical after-taste. Flourless chocolate cake with caramel, vanilla ice cream, and cocoa nibs is better. The way to go if you’re yearning for something sweet is a cocktail. 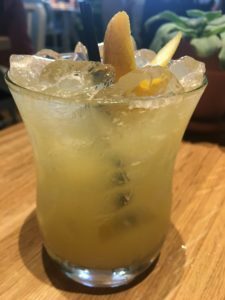 Ginger Margarita with añejo tequila, elderflower liqueur, ginger honey, and lemon is delightful. Besides, it’s the perfect way to make an appropriate toast at True Food Kitchen….Here’s to your Health! Thanks so much for the detailed comments, Terry. I’m going with the Ancient Grains Bowl with steak next time! Love the review (funny anti inflammatory references) and I TOTALLY agree about the key lime pie. Everything else was really good, but that was inedible! desserts there do need a little work but maybe its an incentive to do without!